Why are local action groups important? Why choose Ossberger crossflow turbine? OSSBERGER Turbines are individually tailored and manufactured for the operating conditions to be encountered at any given site (head/water flow). 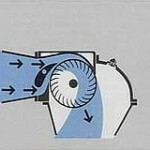 The OSSBERGER turbine is a radial and partial admission free stream turbine. It is classified as a slow speed turbine. The guide vanes impart a rectangular cross-section to the water jet. This flows through the blade ring of the cylindrical rotor, first from the outside inward, then after passing through the inside of the rotor and out again. This flow arrangement also has the advantage that in practice leaves, grass and wet snow, which when the water enters is pressed between the rotor vanes, will then be flushed out again by the emerging water – assisted by centrifugal force – after half a revolution of the rotor. Thus our self-cleaning rotor never becomes clogged. Where a varying water supply requires, the OSSBERGER is built as a multi-cell turbine. The normal division in this case is 1:2. The small cell utilises small, and the big cell medium water flows, with both cells operating to allow maximum flows. With this arrangement, any water flow from just 1/6 flow to 1/1 full flow is always possible with optimum efficiency. This is why OSSBERGER turbines can utilise the greatly fluctuating water supplies normally found on watercourses with a greater efficiency and power output than other fixed flow turbines. Efficiency characteristic of an OSSBERGER turbine developed from the 3 efficiency curves of a 1 : 2 division compared with the Francis turbine. The mean overall efficiency of OSSBERGER turbines is calculated at 80% for small power outputs over the entire operating range. These efficiencies are normally exceeded. Efficiencies of up to 86% are delivered in the case of medium-sized and bigger units. The efficiency curve on the left clearly illustrates the superiority of the OSSBERGER turbine in the partial load range. Small rivers and water courses often have reduced water flow for several months of the year. 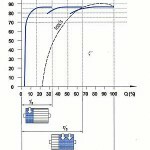 Whether or not power can be generated during that time depends on the efficiency characteristics of the particular turbine. Turbines with high peak efficiency, but poor partial load behaviour produce less annual power output in run-of-river power stations with a fluctuating water supply than turbines with a flat efficiency curve. 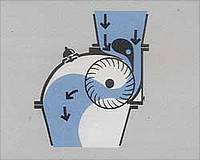 In the subdivided OSSBERGER turbine the admission of feed water is controlled by two balanced profiled guide vanes which divide the water flow, direct it and allow it to enter the rotor smoothly independent of the opening width. Both guide vanes are fitted very precisely into the turbine casing. They keep the amount of leakage so low that in the case of small heads the guide vanes can serve as shut-off devices. Main slide valves between the pressure pipe and the turbine can then be dispensed with. Both guide vanes can be adjusted independently of one another via regulating levers to which the automatic or manual control is connected. The guide vane bearings are maintenance-free. The casing of the OSSBERGER turbine is entirely made of steel, exceedingly robust, lighter than a grey cast iron, also impact and frost resistant. The heart of the turbine is the rotor. It is equipped with blades, manufactured of bright-rolled profiled steel by our well-proven procedure, adapted to end disks on both sides and welded by a special procedure. The rotor has up to 37 blades depending on the size. The linear curved blades produce only limited axial thrust so that the multi-collar thrust bearings with all their disadvantages are eliminated. In the case of wider rotors the blades have multiple interposed support plates. The rotors are carefully balanced prior to final assembly. The main bearings of OSSBERGER turbines are fitted with standardised spherical roller bearing inserts. Roller bearings have undeniable advantages in water turbines provided that the design of the bearing housing prevents any leakage or condensation occurring. This is the essential feature of the patented bearing construction in OSSBERGER turbines. At the same time the rotor is centred in relation to the turbine casing. Maintenance-free sealing elements complete this superior technical solution. Apart from an annual grease change the bearing does not require any maintenance. In its design principle, the OSSBERGER turbine is a free-stream turbine. In the medium to low head range a draft tube is essential however. It reconciles the need for high-water safety and loss-free utilisation of the full head. 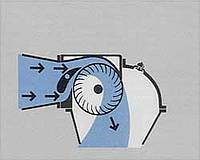 On a free-stream turbine with a wide operating range therefore the suction water column must be controllable if the turbine is to be constructed as a draft tube turbine. This is achieved by means of an adjustable air inlet valve which regulates the vacuum in the turbine casing. In this way even heads of as little as 2 m can be fully utilised by OSSBERGER draft tube turbines. 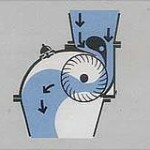 Due to its very design, cavitation does not occur in an OSSBERGER turbine. The turbine is always arranged above the tailwater level. Savings are made with regard to the civil engineering costs. The machine can also be run within the whole range of admission without restrictions. 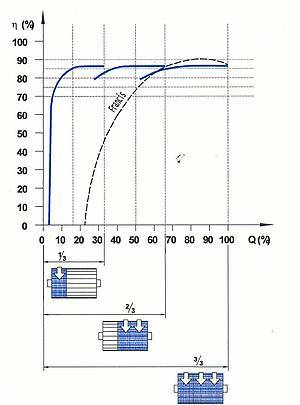 Due to the relatively low run-away speed of OSSBERGER Turbines serial generators can be used. 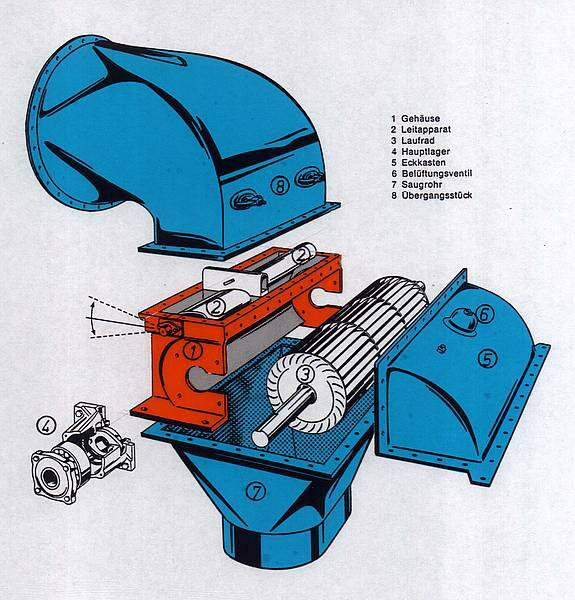 “Keep it simple” was the watchword when developing the OSSBERGER turbine. It is designed for continuous operation over a period of many decades and can be run without any special maintenance equipment. It is frequently installed and commissioned by non-experts – especially in third world countries. Greater environmental awareness means striving to harness natural forces without wasting materials or harming the environment, e.g. generating electricity from recycled energy sources. The use of hydroelectric plants is limited however by one major factor: the high investment costs associated with the design and planning and the construction of machinery and hydraulic engineering. Consultant engineers and turbine manufacturers have therefore attempted to reduce the overall costs by standardising water turbines. This possible course with large turbines leads, however, to problems in the design of small water turbines connected with the water flow and annual range of fluctuations in the water supply. OSSBERGER turbines are built from standardised components which can be configured according to requirements, that is according to the water flow and head of the particular site, to produce a tailor-made plant. This modular system facilitates low-cost manufacture whilst still designing the turbine to best suit any particular project. You can contribute to Water21's work in many ways, using your time, expertise, or other resources.